Got a spare $1000 in your pocket and wonder what to buy for breakfast? How about the $1000 bagel? It's topped with white truffle cream cheese and goji berry infused Reisling jelly with golden leaves. Might want to pick a better accompanying coffee than that cheap cafe up the road! NEW YORK (Reuters Life!) 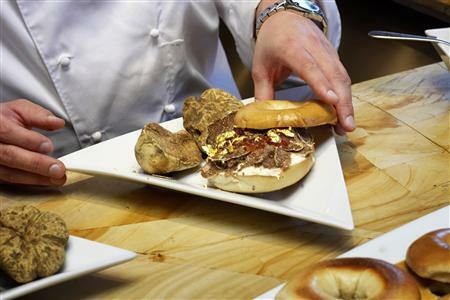 - A New York chef has come up with a luxury version of one of the city's staple foods -- the $1,000 bagel. 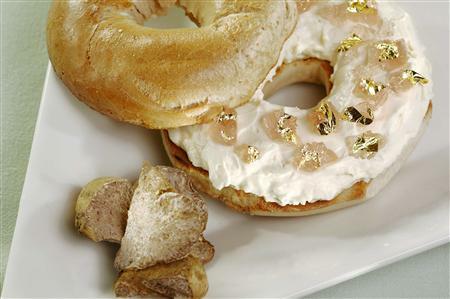 The pricey bagel, that is topped with white truffle cream cheese and goji berry infused Riesling jelly with golden leaves, joins a list of $1,000 delicacies in Manhattan that includes an ice-cream sundae topped with a 23-karat edible gold leaf and a pizza topped with six kinds of caviar and lobster. The bagel is the creation of chef Frank Tujague of The Westin New York hotel at Times Square and was designed in part to help raise funds for Les Amis d'Escoffier Scholarship which provides scholarships to students of the culinary arts. "I wanted to create something that speaks to New York, and is also a reflection of my culinary passion for seasonality and fine ingredients," said Tujague in a statement. 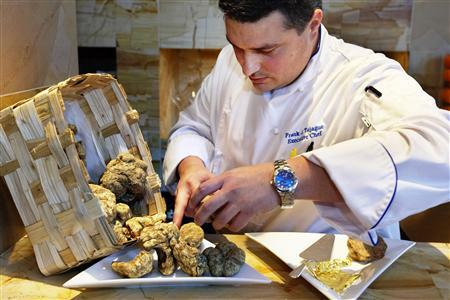 He said by weight, white truffles -- also known as "white gold" and "kings of the table" -- are the second most expensive food in the world next to caviar. Like mushrooms, truffles are the fruiting bodies of fungi, except that they grow underground instead of popping up on the surface. They grow in a symbiotic relationship with trees, taking sugar from the roots and giving back minerals. Truffles are said to be an aphrodisiac because their aroma is similar to that of pheromones, which are irresistible to some mammals and can be picked up by dogs and female pigs used to sniff out the precious tubers. With a limited seasonal window from now until the end of the year, the $1,000 bagel is only available until December 14. "Bagels are a New York food landmark, which is where the base for this dish came from. White truffles are a simple, quality ingredient that takes the meal, or the bagel in this case, to the next level," said Tujague. "By giving back a portion of the proceeds, we are inspiring future chefs to think outside the box and maximize culinary creativity." One bonus -- guests who decided to order the bagel the required 24 hours in advance need not worry about tax and gratuity. Those are included.